We have already established that everything is better on a stick; from bits of cake, to hot chocolate, to pretty mini-pies. 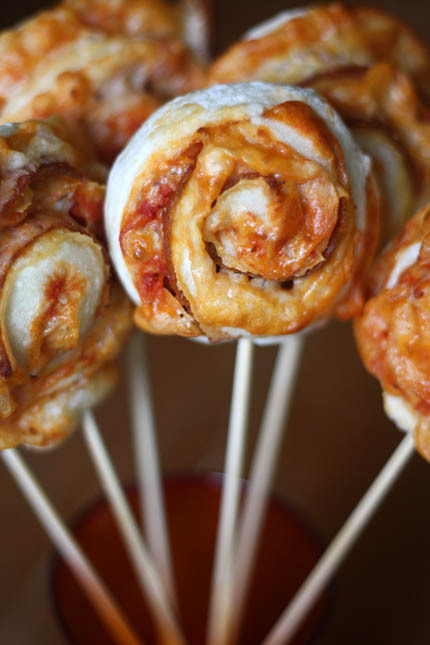 But if pizza is the best food in the world (a claim my husband continuously makes) and everything is better on a stick, then it certainly doesn't take a rocket scientist to know that Pizza-on-a-Stick may very well just be the all-time, best food ever! 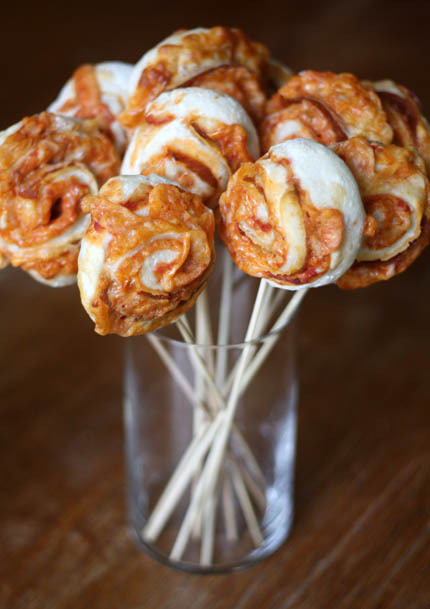 This yummy tutorial from Artisan Bread in Five is both loads of fun and sure to delight husbands, wives, and kids everywhere! 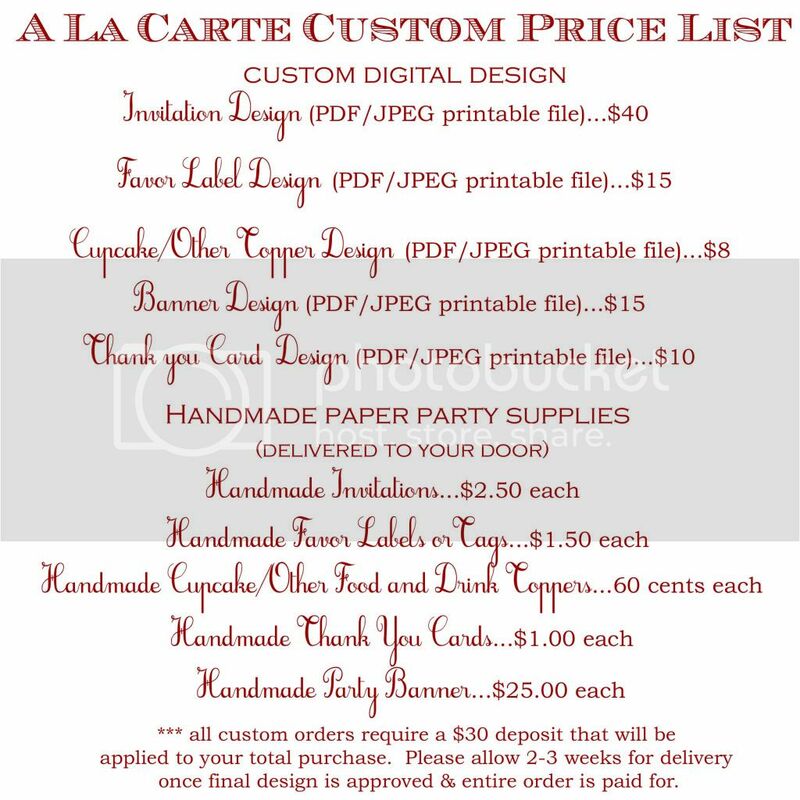 Just see for yourself . . . 1.) 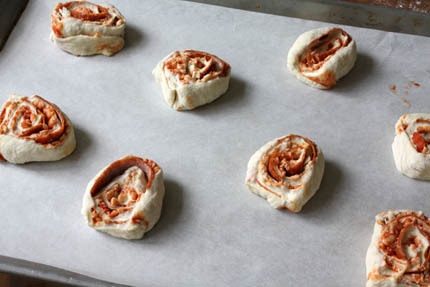 Preheat the oven to 400 degrees and set up 2 or 3 baking sheet pans with parchment paper; set aside. 2.) 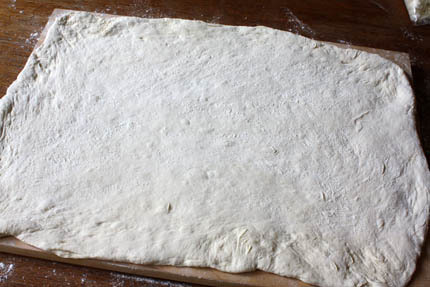 Roll the dough out to a 1/4-inch thick rectangle, using enough flour so the dough doesn’t stick. 3.) 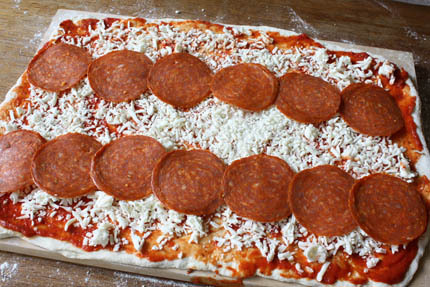 Layer on the sauce, cheese and pepperoni. 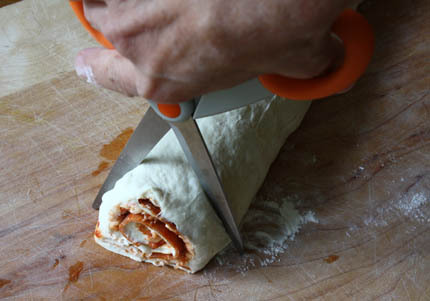 Leave some of the cheese exposed (don't cover with toppings, that is:) so that it can melt and act as a glue, to hold the pizza rolls together. 4.) 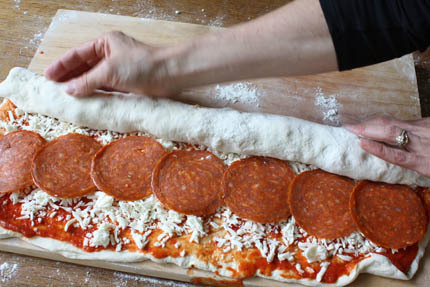 Roll the dough into a log, starting at the long end. 6.) 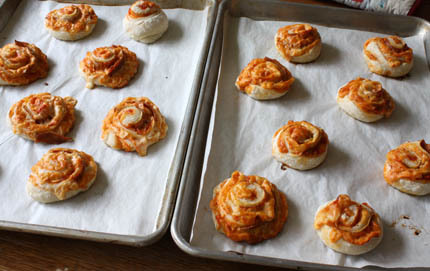 Place them on the prepared sheet, leaving plenty of space for them to expand when they bake. Allow them to rest on the counter for about 15-20 minutes. 7.) 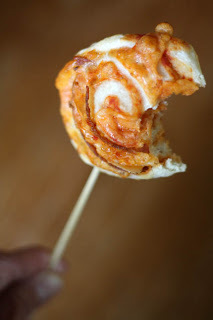 Bake for 15-18 minutes, or until golden brown and the cheese has melted and caramelized a bit. 8.) 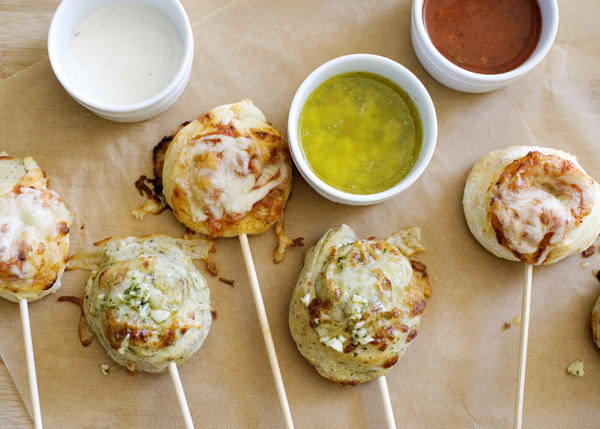 Put them on a stick or let them cool and pack them in a lunch box! Now that is what I call a pizza party! I am thinking you could come up with some very tasty dipping sauces to go with these too...garlic butter, pesto, extra marinara, or ranch! 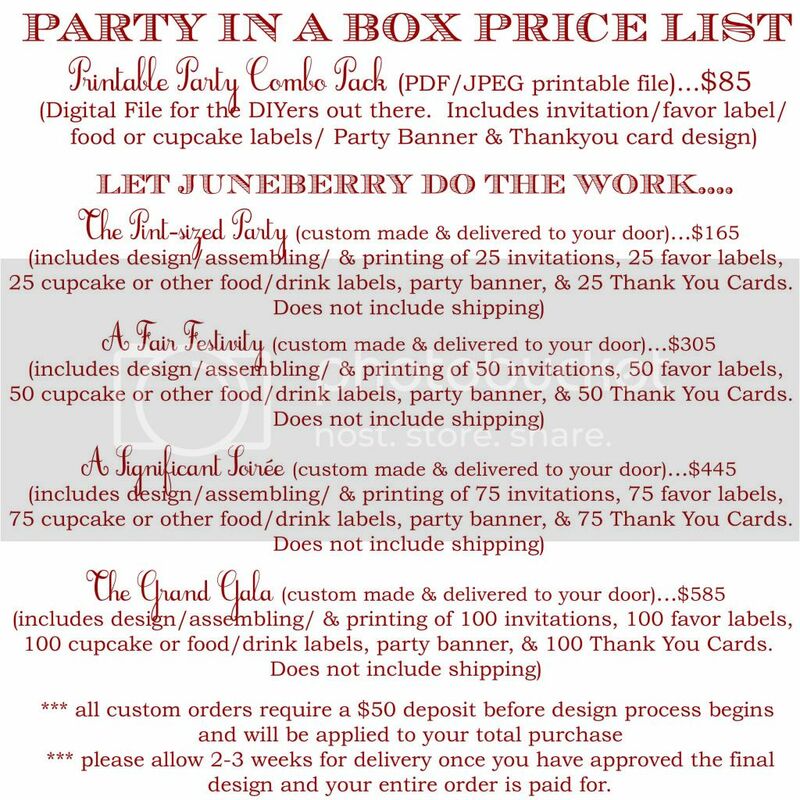 And the best part is you can gobble up as many of these goodies as you would like . . . as calories don't count when you are having just a bite, right? Oh well, we have a few more months until bathing suit season anyway, so go on ahead and enjoy them!